Intent on their play at one of the monthly tournaments at Beth Emeth. Like clockwork, people filter into Congregation Beth Emeth around 9 in the morning for coffee, bagels and conversation on one Tuesday morning each month. The mood is light and laughter can be heard throughout the room. But as the time approaches the 9:30 a.m. start the atmosphere in the room suddenly shifts, becoming serious as competitors take their seats at a table for four and focus their attention on the tiles. It’s time for the mah-jongg tournament. For the past 30 years, mah-jongg players have gathered at Beth Emeth on Academy Road in Albany to compete and break bread during the monthly tournament. Sponsored by the congregation’s sisterhood, many of the players, mainly women, have been coming for years. This popular event that allows them to use their skills to win cash prizes, share a meal together and socialize with friends. The number of players in attendance each month varies depending on the season. 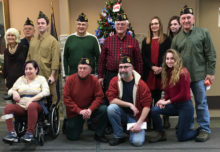 There are often as many as 14 tables in the summer, but the numbers go down to 8-10 in the late fall and winter because many of the players are snowbirds, according to Jan Rubenstein, a Beth Emeth congregant, who has been running the monthly tournaments since their inception about three decades ago. 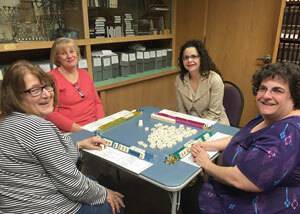 Barbara Severance, Linda Rullan, Liz Goldstein and Beth Davis at a recent Beth Emeth Sisterhood mah-jongg lesson. There are a core group of players, Rubenstein reports, but adds that there are new people who join every month too. “We’re always trying to get more young people to come,” she said. Although it is important to know the rules well and be ready for a fast-paced game, one of the major goals is for everyone to have fun. “We try to make it as friendly a game as we can,” Rubenstein added. Although the custom of a monthly tournament has remained the same for years, some changes have been made to keep up with modern times. Years ago, the players would cook an elaborate lunch at the temple, but the sisterhood now just provides bagels and coffee for breakfast and various noshes and drinks during the tournament. Some players choose to bring their own lunch. An annual barbecue for players during the summer is still a tradition at the temple. 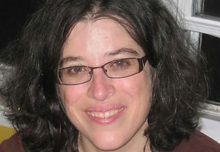 The popularity of mah-jongg in America, especially among Jewish women, is not new or unique to Beth Emeth. The game has worldwide appeal and a rich history, beginning in Asia. Mah-jongg is a tile-based game that originated in China in the mid- to late 1800s and spread throughout the world in the 20th century. In the early 1920s, Joseph Babcock, a businessman working in the oil industry in Asia, brought the game to the United States, wrote a book of rules for American play and applied for a patent for the game domestically. The first American mah-jongg sets, which included slightly different rules than those in Asia, were first sold by Abercrombie & Fitch almost a 100 years ago. A century later the game remains popular in East and Southeast Asia, but also among American Jews, in particular with women. While most mah-jongg players prefer to meet face-to-face to enjoy the game as a social event, there are also some who prefer to play the game online. Meryl Schwalb, game teacher, left, works closely with four new players. playing mah-jongg and each player develops a strategy for organizing them. 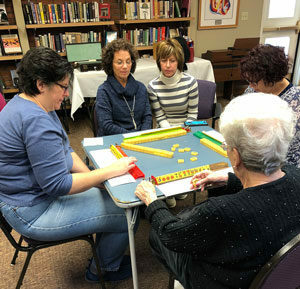 “It like a bizarre form of gin rummy,” said Meryl Schwalb, a Beth Emeth congregant who organizes and teaches mah-jongg at Beth Emeth on Sunday mornings. According to Schwalb, Mah-jongg is a game that involves skill and strategy with a certain degree of chance as well. “The lessons, offered by the sisterhood for the past five years, are great for players who are just starting and don’t feel ready for tournaments where things move very fast,” stated Schwalb. She said that the lessons were started based on the realization that many had an interest in learning the game and for the many parents who wanted something to do while their children were in religious school. 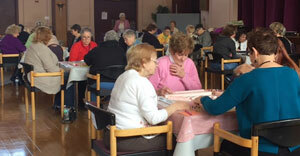 The temple typically has 2-4 tables of players on a Sunday morning once a month. Each table has a teacher with experience guiding players with different levels of proficiency at the game. “It is best to come at 9:30 a.m. to enjoy coffee and a little more than two hours of playing and learning,” Schwalb said. “It is a complicated game in that there are lots of rules to remember. It takes time to learn and remember all the nuances, but these Sunday mornings are a great way to get started,” she asserted. In addition to the competition, Schwalb said that she has made life-long friendships with people since she started playing the game close to 20 years ago. “It is wonderful to see the friendships and socialization that also comes from the love of mah-jongg,” she said enthusiastically. 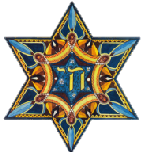 Those interested in playing mah-jongg are asked to register in advance for both the tournaments and lessons at Beth Emeth. The fee for the monthly tournament, which is a sisterhood fund-raiser, is $22 and is open to all players and their friends. The tournament players follow National Mah Jongg League Rules. Upcoming tournament dates are Dec. 18, Jan. 15 and Feb. 12. All monthly Tuesday tournaments run from 9 a.m. until 3 p.m., with play beginning at 9:30 a.m. Registration is online for tournaments at bethemethalbany.org. Rubenstein at 518-459-4118 can provide details. There is no charge for the mah -jongg lessons, which are held from 9:45 – 11:45 a.m. on some Sundays during religious school sessions. Upcoming dates for lessons are Dec. 16, Jan. 13 and Feb. 3. Registration for lessons is with Schwalb at meryl@merylandjon.com. Deb Sokoler at dsokoler@bethemethalbany.org can help with babysitting needs.